Planning for anything is critical and planing Audio Conferencing with Teams is important as well. There’s more than you think to consider when enabling Audio Conferencing in Teams for your users so lets take a look. I did a Video Summary on the introduction video here if you want to check this out first. This is the planning session on Audio Conferencing and first we start with Terminology and theres quite a few terms used in this video. Audio Conferencing (With Capital A and Capital C) refers to Audio Conferencing in Office which allows callers to join meetings hosted by Teams and SfB Online. In Office 365 to set up a toll free number your organisation must have Communication Credits enabled formally known as PSTN consumption billing. This is a set of funds setup by your organisation for toll free usage and also for international dial out. For the Audio conferencing service dial out mean the ability to join the audio portion of the meeting using their phone not PC audio or meeting organiser can dial out / invite other participants using their phone numbers. 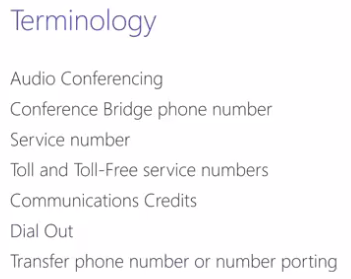 The service numbers can be obtained from Microsoft or if you want to port existing conference numbers these can be transferred (ported) to Microsoft. What’s the planning steps involved ? To plan Communication credits its not an exact science and relies on toll free, start on total of conference minutes x participant. If you currently operate another service you may be able to gauge the meeting minutes and use the call rates. For dedicated these are available to your tenant only and offer the most flexibility and you set your own languages. 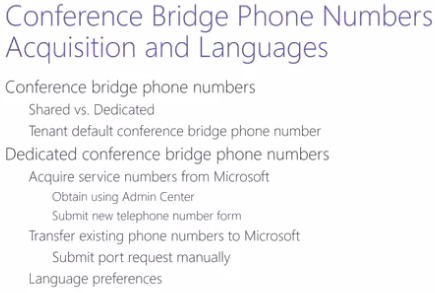 Default conference bridge phone number toll or toll free assigned to a user are determined by the Office 365 subscription location. 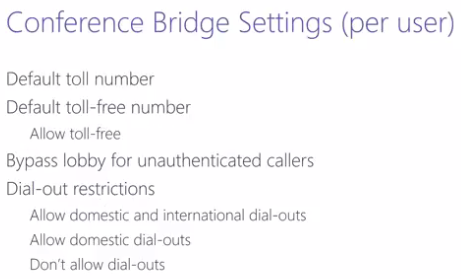 For example users with Australia will be assign Sydney conference phone numbers you can set one bridge number as default. For dedicated service phone number you can choose to acquire new service number or transfer (Port) a phone number. To acquire you can use the admin centre or submit new telephone number form to Microsoft service desk. The use of new telephone number form is new and too support requirements that cant be submitted via the office 365 admin centre. Availability of brdige number can be limited by country, region and city therefore shared numbers may have to be used in some scenarios. If your country / region is only covered by Audio Conferencing and are not listed as approved countries for Calling Plans it recommends contacting the Microsoft service desk to enquire as there could be legal reasons why porting of existing numbers cant take place. Dedicated phone number provide flexibility around languages, you can add up to 4 additional as well as the default so 5 in total. Once this is completed you can continue to plan to document types of phone numbers you want to use for each of your office locations and to obtain new or use existing for each office location. For more info on porting there is separate video on this here. For phone users to join meeting as authenticated they need to use their conference pin. You should document the tenant wide configuration setting as part of your planning. You can set default numbers that are displayed in meeting invite, you can allow users to bypass lobby and set dial out restrictions and disallowing toll free and or dial out. Its recommended to plan for them so when they hit GA you can take advantages of them. If you wish to enable dial out as part of Audio Conferencing you need to decide how you want to handle dial behaviour from end users. Effective dial plan is used to normalise numbers when using dial out from conference. By default the service dial plan which is created for each countries and assigned to user based on licence location is use to handle dial out scenarios. You can assign tenant dial plans, if you assign tenant dial plan to tenant or user the effective dial plan will be a combination or service and tenant dial plan. There are a limit of 25 normalisation rules on each tenant dial plan and highly recommended to avoid duplication’s on the service dial plan. 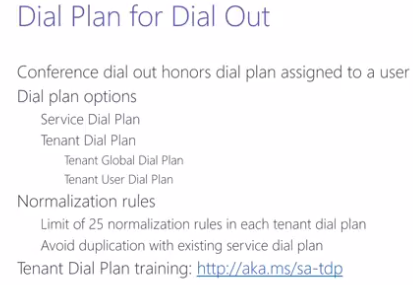 As part of planning document dial plan configuration this may included office locations and office location better served by service dial plan. Audio Conferencing is only available for scheduled meetings in Teams today!